One of my constant goals is to stay organized and beat back the mountain of papers that come along with teaching. Every time a pick up a stack to sort through it, I seem to find papers that are as old as my teaching career. I could just throw everything in the trash, but I have this problem where I feel the need to know what I'm pitching. Then there are the papers I copy for every class and the papers I get back to grade and the papers I get from weekly meetings and the papers with my lists of things to do and so on and so forth. Sound familiar? Don't get me wrong, papers have not swallowed my classroom whole....yet, but beating back the prolific paper piles is a constant job. Keeping organized so that the most important papers don't get tossed out with the excess takes time, attention and planning. So, what do I do? Here are a few things that I use--and a few things that I should start using--to help me be better organized. 1) I keep a small calendar with me at all times to record meetings and due dates throughout the year. Free templates can be found at WinCalendar. 2) There are several places where you can save papers online. Of course there is Google Drive, but there is also Evernote. Both places allow you to save documents, notes and images. 3) Three must-have binders: plans and calendars, student information and substitute materials. Check out this blog for more details. 4) I always have daily and weekly to-do lists. I start each week by laying out the things that I need to accomplish. I keep my to-do lists in a notebook, but there are also cute online templates. 5) The Adventures of Room 83 has a great blog entry about organizing papers, with ideas for how to categorize supplies and files. 6) Want dividers to categorize your important files? Check out these cute binder covers. 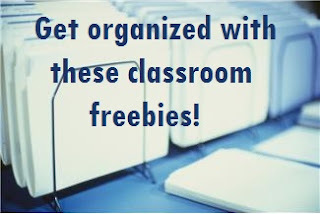 7) And, my favorite...Scholastic has 100 organizing tips for arranging your classroom without paying a cents. If reading over this blog for 30 minutes saves you five minutes a day throughout the coming school year, then it is time well spent.